I don’t know about you but I absolutely adore salsa….just about all salsa! My very favorite is my homemade fresh salsa which I will share with you how I make it today but remember simple is my motto and I don’t follow directions well at all so its kind of a different re-arrangement every time! I love my cooked salsa that I can up to eat in the middle of the winter and it is made with all fresh unprocessed spices and ingredients and it tastes like summer in a jar. I love salsa so much that I recently told my nutritionist that corn tortilla chips was the one thing that I would refuse to give up because salsa in my opinion tastes best on a yellow corn tortilla chip there is no better combination! 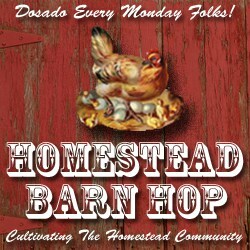 I love salsa verde, cooked salsa, fresh salsa, and I love all the combinations of salsa’s and chutneys too. Peach salsa is another fave I made that last year and I love it with a nice piece of tender white fish cooked in a little bit of olive oil. So the way I make my salsa is just like this I go out to the garden and I collect a variety of tomatoes….some are cherry tomatoes, some are roma, some are these beautiful reddish pinkish orbs I have no idea what variety they are and I try to save my slicing tomatoes for a sandwich for example today we are having Bacon and Tomato sandwiches because my lettuce in my garden has fizzled out and I really do not enjoy lettuce from the grocery store anymore once you have had your own delicious lettuce it is hard to go back to store bought. 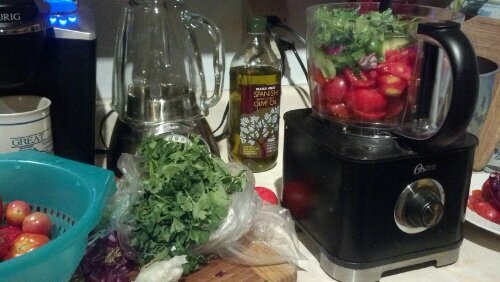 I then wash all of the tomatoes and put them in my new food processor the kids and my hunny got me for Mothers Day. 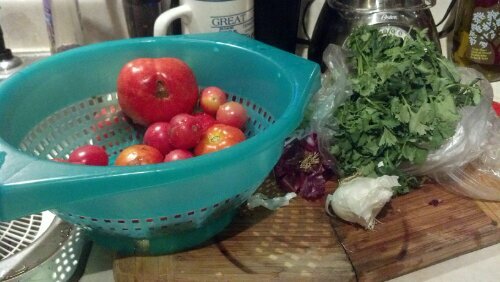 I then add a couple of chunks of red onions, and whatever sweet peppers I have in my garden. I don’t like a lot of heat in my salsa so if I do add any at all it will be in the form of a half of teaspoon of red pepper flakes. I then add two cloves of fresh garlic, a tablespoon of fresh olive oil (smell first), some salt and pepper to taste. 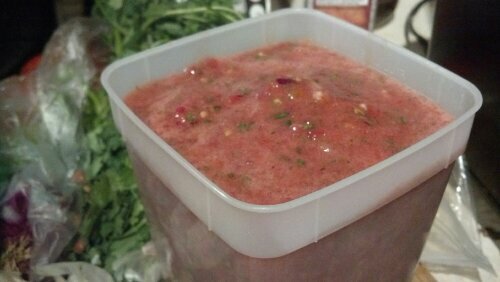 I then pulse until it has the desired consistency and then store in the fridge. Then eat until your hearts content 🙂 Nothing like fresh salsa! Karen, if you can salsa for later use like in the middle of winter, what else do you do? 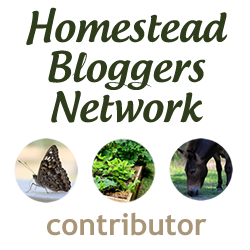 I would like to see this next step in the process in your blog. I did a post about salsa just today, where I compared 3 different recipes of salsa, seeking my very favorite. 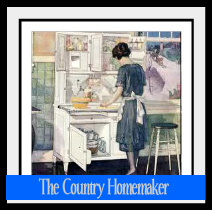 I found 3 great recipes. YUM!! Our tomatoes are still green 🙁 Waiting patiently. This looks super tasty Karen. Ole! Well that keeps things interesting. 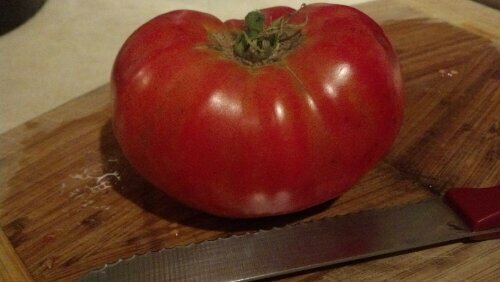 As new tomatoes ripen and other ingredients get added or deleted, it always changes, same here. I knew we thought a lot alike 🙂 and you are right it does keep things interesting! 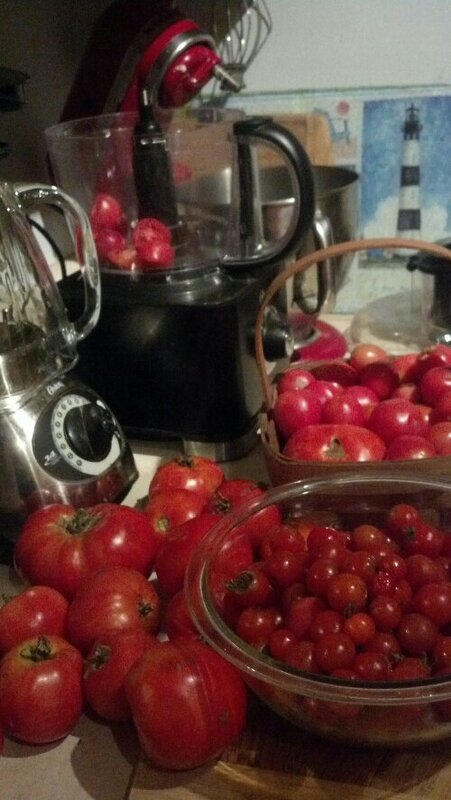 Can’t wait for my tomatoes to ripen so I can start making my own salsa too! Thanks for making my mouth water! Pico de gallo. 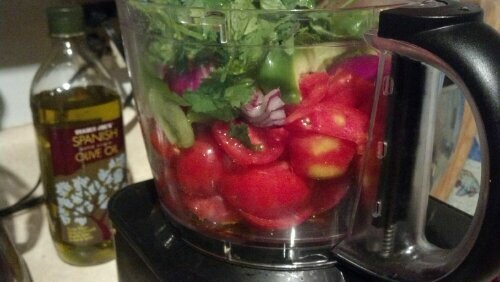 My favorite salad (chopped rather than salsa) which is tomato, jalepeno, cilantro, onion, and lime juice. I could eat it every day. Any tomato salsa makes my mouth water! I too love me some Pico! YUM! Thanks for stopping by Shannon! That salsa looks wonderful. Thank you for sharing KarenLynn. Stay cool in this heat.